The Beaconsfield Niblick- Mar 19 :: Beaconsfield is a traditional Members club with a classic Harry Colt designed course that opened in 1914. The course is beautifully presented and complemented by excellent practice facilities. Visitors are welcome by prior appointment. Thankfully we seem to be heading into spring. I am so pleased to see the back of those cold days and of that wind. 40 to 50 mph gusts do not help when playing golf although looking at some of the competition scores in March you could be forgiven for thinking that they must have been played in warm, quiet conditions. As well as the weather, we have had the very essential course maintenance which made the greens interesting and before the grass starts growing there have been some challenging lies to play from. It all goes to make Mark Conway’s 44 points in the Midweek Stableford mightily impressive, along with others in the 40’s and high 30’s. Talking of the others, I think Paul Blackburn deserves a mention. He won the February event with 41 points and must have thought his 42 points in March was in with a chance before Mark’s score pushed him into the runner up spot. While on the subject of impressive scoring, the Seniors held their Spring Meeting in the midst of those difficult conditions and that was won by Bob Heard with 42 points. He had also won the Seniors’ Bogeys Bowl last autumn to complete his version of the Tiger Slam (all the majors held at the same time although not in one calendar year). He had 11 single putts! The annual match between England and the Rest of the World was held on the 2nd March. There is a very large wooden spoon which is presented to the losers by the winning captain and Iain Duncan (Rest of the World) had a very wide grin on his face as he presented the spoon to Nick Cray (England). Thank you to everyone that played and especially to the captains. I should perhaps just mention that the ball of one of my opponents (11 handicap) nestled about 6 feet from the pin on the 4th in just 2 shots. How he can sleep at nights is beyond me! The Lidgely Shield must be the biggest trophy that I have ever seen. It is played for between the Artisans and the Club and the latest competition was held on the 16th. The weather forecast for the day had been horrendous and I was prepared to suggest playing over just 10 holes and I even had an alternative date in mind if we had to cancel. As it turned out it was not too bad and the Club won 4 matches to 2 having been 2-0 down at one stage. That result was incidental to the great spirit in which it was played. The more important result was the all square score in the banter competition. Together with the rest of the Board, a few weeks ago I was privileged to have dinner with many (over 20) of the Past Captains. It was fascinating to hear stories of when the club went through difficult times. It made me realise just how well served we were in the past in order to build the foundations for our current situation. Now a few words about Societies. We are just coming into the time of year when we will start to see Societies playing on Tuesdays and Wednesdays and we are hoping to attract more than we have in recent years. I know that they can sometimes attract criticism for slow play etc. but they provide a considerable source of income for the club. Last year we took over £42k in Societies fees and of course they also spent money over the bar and in the pro shop. We will be starting and marshalling the larger Societies and reminding them of their responsibilities when visiting our club. In return, when the chance occurs please be welcoming to them because after all, they are our guests. Finally, not a rant but a plea. When using the short game practice area, please pick up the balls at the end of your session and leave the area as you would wish to find it. I’m off to West Wales for 3 days golf at the beginning of April. Oh how I wish England had won the 6 Nations! One of the nicest things about being the Ladies’ Captain is that you are not only aware of, but can be involved in all the many events and competitions that happen throughout the year. 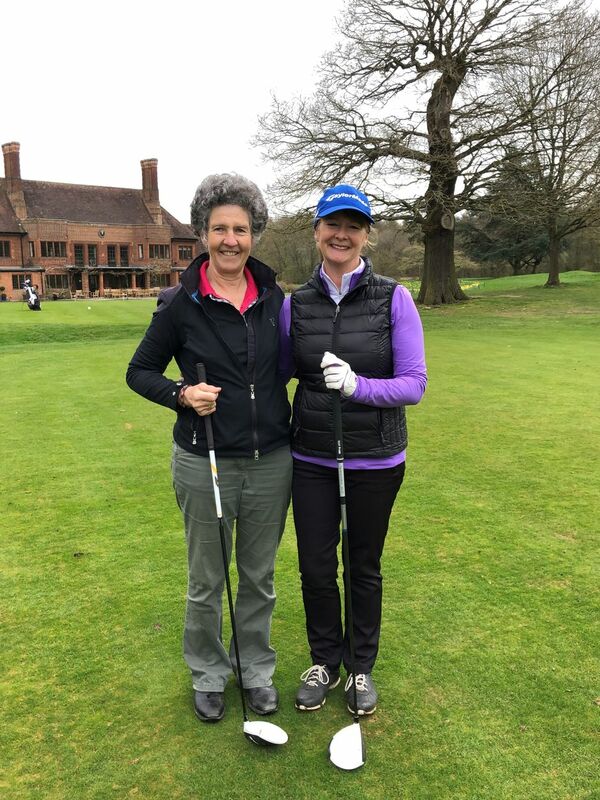 Beaconsfield GC was brilliantly represented by Irene Brien and Julie Cooper in the recent London Foursomes Scratch Knockout competition which took place at The Berkshire Golf Club. With wins on the 19th and two on the 17th, they battled their way through to the quarter final stage, where they came up against the home side, who also happened to be the defending champions, and were only narrowly beaten on the 17th. Thank you to my fellow trolley pullers Eilish Kelly, Sue Schmidt and Lesley Roberts. It was a privilege to be able to watch and learn from all four matches. Ladies, you did us proud. At home there has also been some good golf. Congratulations to Caroline Adams on scoring 42 points in our March stableford and having her handicap cut by 5 shots! Di Bovey and Sue Mears were our finalists in the Olive Cripwell winter knockout competition. A friendly final saw Sue come out on top. Congratulations to you both. Chloe Oldfield, a sports psychologist, came to talk to us about how a positive mindset can help our game. Imagining what we are going to do rather than what we must not do (go in the pond!) is important. As is accepting mistakes and learning from them. Our Get into Golf scheme starts its summer programme, with 10 ladies continuing into year 2 and 12 ladies starting year 1. Thank you to Chris and Adam for teaching and encouraging these ladies as they grapple with the fundamentals of a golf swing. The first event for our juniors this year, was a demonstration by Andy McFee, on the new rules of golf. The juniors thoroughly enjoyed this session and we wish to thank Andy once again, for spending time with our young players and helping them understand these new rules. It is always easier to have a practical demonstration and Andy has always supported our Junior Section by giving them regular ‘Rules Talks’ over the last few years. During the winter months, everyone has been practising and preparing for the competition season, in the hope of reducing their handicaps every time they go out on the golf course! 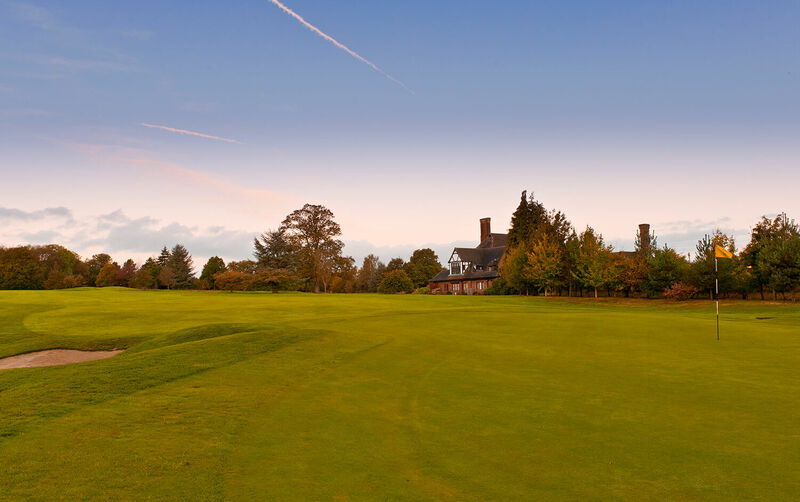 The match season commences on 9th April, when three of our juniors will represent Beaconsfield, in the annual BB&O ‘Junior Champion Club’ which will be held this year at Harleyford. Our Team will be Ben Quick, James Casserly & George Johnson, so we wish them the very best of luck in their first event. The Chiltern League matches begin on 17th April with our first match away at Ellesborough. This year we have 4 home matches and 3 away matches, so the Junior Squad are keen to get back to winning form. The very popular Beaconsfield Team Championship is only a few weeks away on Friday 19th April and the juniors are eager to defend their title. All the sections of the club go ‘into battle’ in this special competition, to try and win the enormous Trophy which was first presented by Tim Whittaker 3 years ago. This will be a great day for everyone! All our junior boys and girls have the opportunity to play in the BB&O (Berks, Bucks & Oxon) and the BCLGA (Bucks County Ladies Golf Association) events. You will find full details of all the competitions on their website at www.bbogolf.com and www.bclga.org.uk or click on the ‘links’ on the Junior Page on our own website. There are many events throughout the year including the BB&O ‘Futures Tour’ and ‘Development Tour’ and the BCLGA organise a full programme of events for the girls, including Championships, Matches and ‘Pre-handicap’ sessions for young girls who are just learning to play the game of golf. At this time of year, we will be welcoming new junior members to join our section. 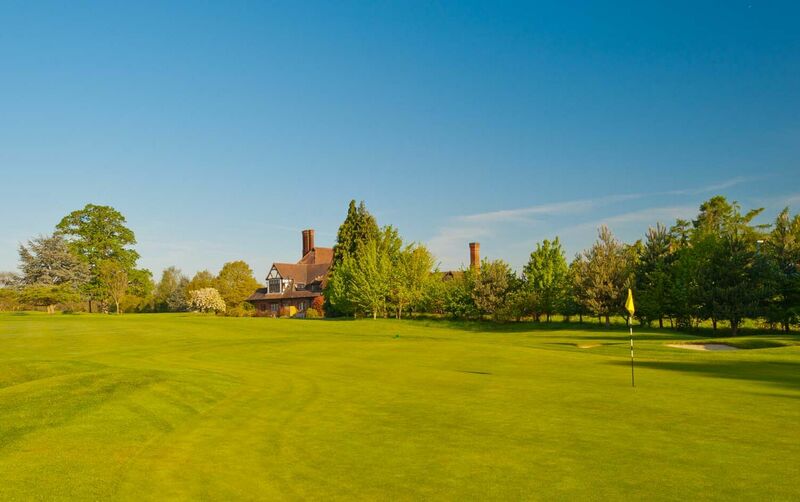 Beaconsfield encourages family membership, so if there are any Members with children, grandchildren, nieces or nephews, who are interested in playing golf, please contact the office for further information. 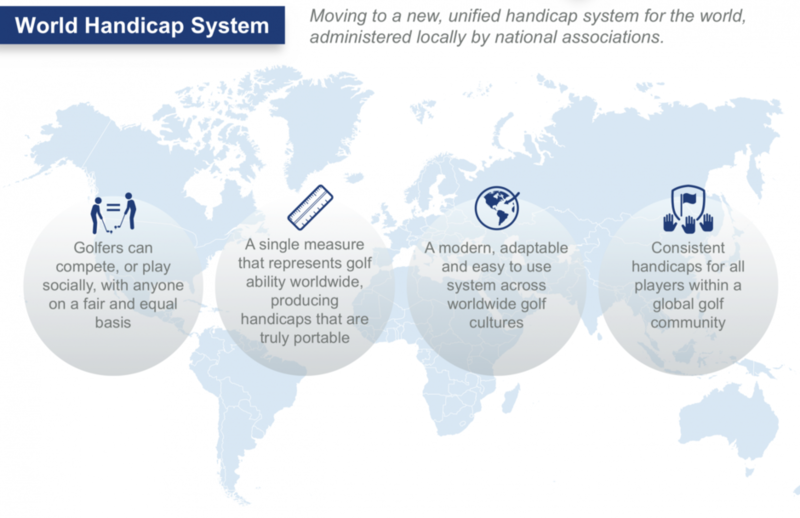 In the Golf Bag.... World Handicapping System - What is Slope? For those of you who are members of golf clubs in Continental Europe, USA, Australia or South Africa, you probably know all about slope. The Course Rating (new term for Standard Scratch Score) is a measure of the difficulty of a golf course for a scratch golfer. The Slope Rating is a measure of the relative difficulty of a golf course for a handicap golfer. The Slope Rating is used to adjust your handicap so that you will get more shots playing a relatively difficult course, and fewer shots when playing a relatively easy course. Slope Ratings range from 55 (very easy) to 155 (very difficult). A slope rating of 113 means there is no adjustment to handicaps. The average slope rating for all courses in GB&I is around 124. For example, Tom and Harry decide to play at Wexham Park from the white tees, which has a Slope Rating of 115. Tom’s Handicap Index (the new term for exact handicap) is 2.8 and Harry’s is 16.1. If you think about it, this seems quite fair, as Harry is likely to find the course much more difficult, so needs quite a lot of extra shots. This adjustment is made every time you play, so your Course Handicap will vary depending on which course and tees you are using. Don’t’ worry -there will be phone apps to calculate Course Handicaps, and whenever you play in a competition the software when you sign in will calculate your Course Handicap. The greens have started growing and are starting to shape up nicely with cutting or rolling taking place daily. The height of cut has been dropped to 4mm and will continue to drop down to 3mm by early April. The greens have already received 100 tonnes of sand which will set them up well for another great season; with regular lighter 8-10 tonne applications continuing fortnightly to improve surface trueness. Verti cutting (light scarification) will start in the afternoons to thin out any coarser grasses, and will continue weekly until the putting surface is uniform. All of the drought renovated bunkers are back in play, as are the 9th fairway and one at the front of the 7th green. The remaining two bunkers on 7 will be back in play shortly once topped. The tees have been hollow cored, fertilised and sanded with all new tees due to be open before the end of March. There are still some approaches left to renovate, this will be done around golf during April. The carries have been scarified to remove dead organic matter and over seeded with more drought tolerant grasses. We will monitor the recovery of these areas closely and may need to repeat this process later in the season. Sharp sanding the high traffic areas will be coming to an end. 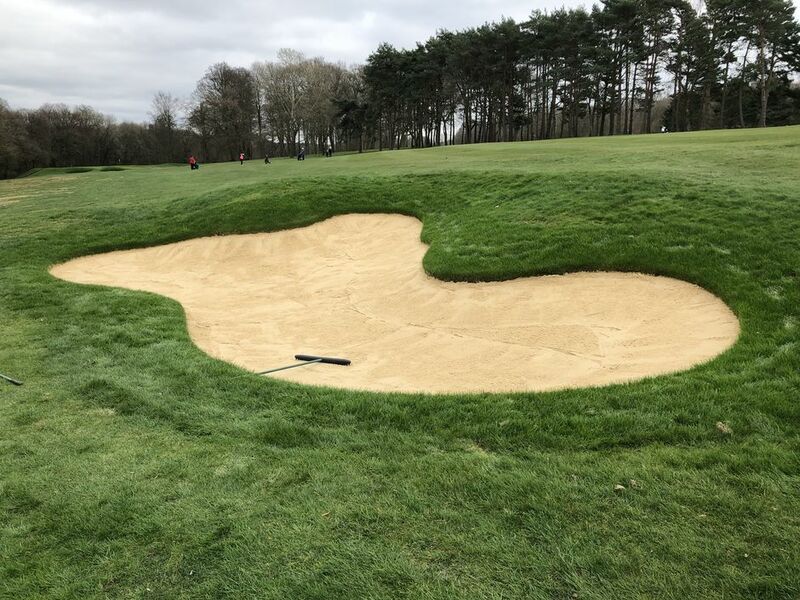 This is the second winter of applying the coarse sand which is proving to be very successful in maintaining grass and reducing wet, slippery conditions. 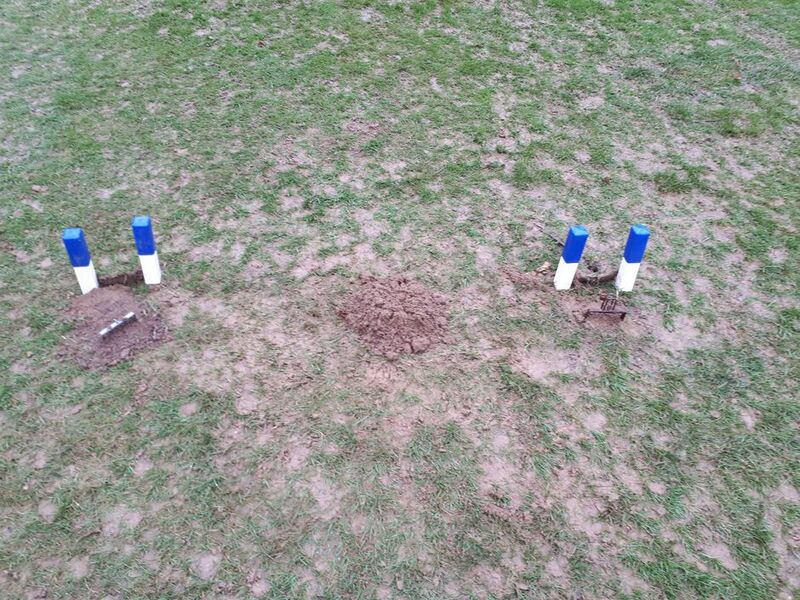 This procedure will now continue yearly to build up a profile of sandy free draining soil to aid winter play. The majority of the traffic management posts and ropes have been removed with a few remaining for 2 more weeks. Thank you for respecting these controls and please continue to be aware of any wet and tender areas over the next 2-3 weeks and take your trolleys around the outsides of the greenside bunkers to aid in their recovery. Everything is being fertilised, with a herbicide included on the tees, approaches and fairways to pick out any weeds. We are now entering full cutting season so the course should come back to life pretty quickly. The first fairway divot of the season is booked in for the second week of April and the team will begin to focus on divoting the immediate 10-15 yards around the greens. Greens stimping will be in place for the spring meeting and will continue for the rest of the season. We are hopefully seeing better weather ahead of us which means more golf and more visits to the club. This article should reach you before our Mother’s Day Lunch takes place on Sunday 31st March. If you would like to attend this very popular lunch, please email me at david.jennings@beaconsfieldgolfclub.co.uk or phone the bar on 01494 681180 and we’ll be happy to put your name down. Golfing Societies and our club golf matches are starting to appear in the diary, which means more activity both on the course and in the clubhouse, which always adds to the ambience of the club. We have the Team Championship taking place on Good Friday, hopefully played in bright s unshine, followed by lunch in the dining room. In the coming months we will be having 2 BBQ’s, for Captain’s Day on Saturday 8th of June and the Ladies and Men’s Club Championship on Saturday 29th June. A reminder also of our regular Sunday Roast Lunch, held downstairs every Sunday. These lunches are often over-subscribed, so booking early assures you of a table. Enjoy your golf and I hope to see you soon. 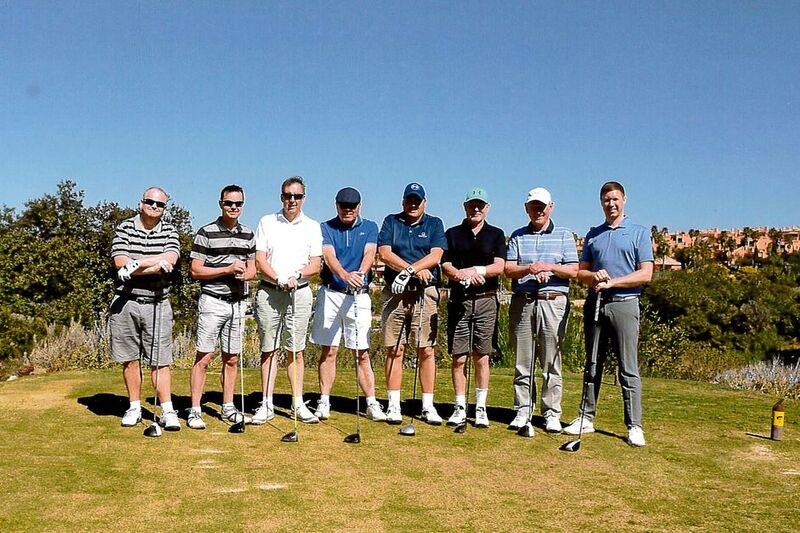 I have just returned from from my annual trip to the Algarve with 7 of Beaconsfield's finest, we played the two Quinta courses, Laranjal and a new course for us, the Nick Faldo course in Amendoeira which had mixed reviews from the group. (here we are pictured on the 1st tee). While Beaconsfield was being battered by very strong winds and heavy rain we were very lucky, we had unbroken sunshine and it was 20'C or better every day. Thanks to every one on the trip for a great time as always and congratulations to Melvin Weir who won. With the Masters coming up in a few weeks time, we have just started our sweep stake, usual rules £2.50 a player, we will do the draw just before the start, if your player is 1st, 2nd or 3rd you win a voucher to spend in the shop. Adam is on his holidays at the moment, lying by a pool in Abu Dhabi and Tom is practising for his first professional tournament coming up in early April at Datchet Golf Club. This is the best offer of the year!! A dozen balls Free when you buy 3 Dozen Pro V1/X or TP5/X personalised balls. Contact the shop to order or for more details. Members will see a new face in the office from April. As Liz will be reducing her hours over the next month, we have recruited Sharon Gordon who will be helping out Wednesday through to Friday. I'm sure you will wish her a warm welcome to the Club. These fees have not changed for several years. With effect 1st April 2019 the Green Fee charged to guests signed in by a Member will increase from £22 to £25 and the cost of Green Fee vouchers will increase from £14 to £15. The Club is conscious of the increasing pressure on tee slots and will do its best to maximise opportunities for Members to play. The first tee time for the April 14th Monthly Medal will be 0730 not 0800 as per the Club diary. Members are reminded that there is no play permitted before 0730 without express permission from the Office. The Club is going to trial the sale of bacon rolls at the weekend. These will be available from 0700 on both the 6th and 14th April. The House Committee have been considering how to make the 1st floor accessible for people who have difficulty getting up the stairs. 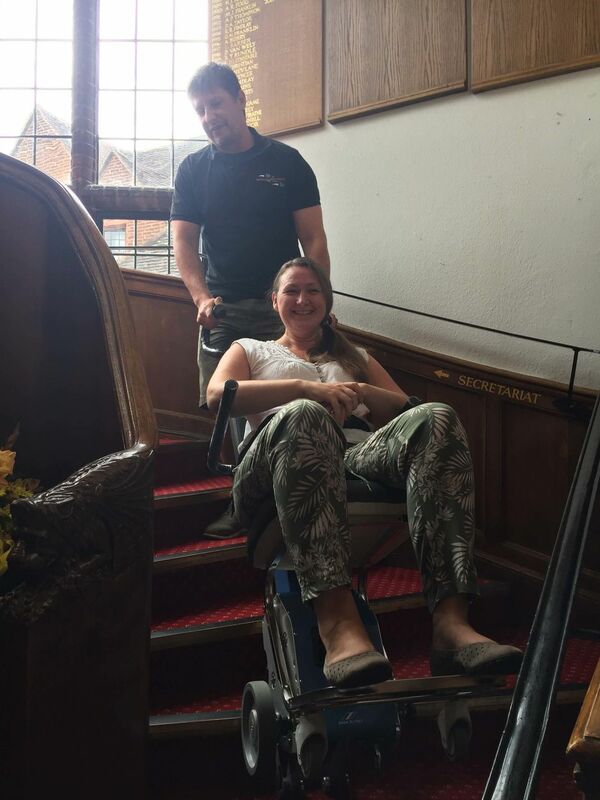 As a lift is not an option at this present time and a chair lift cannot be fitted to either stair cases, another option was to look at a stair climber. 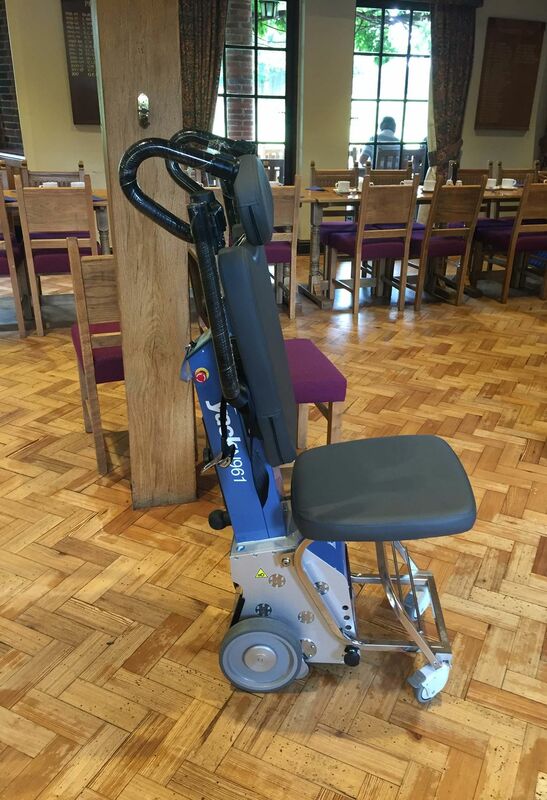 After a successful (and fun) demonstration the club have purchased a Sky Stair Climber with a wheelchair adaptation. This has now been delivered and is ready for use. Full training has been given to the staff so if any member or guest cannot manage the stairs please ask at the Bar for assistance. 31st March - Clocks go forward and Summer starting times begin. 1st April - Entries close for all ladies summer knockout competitions, please make sure you sign-up before the 1st. You will find the competitions in the diary section of the website, on the 8th April. 15th April - Entries open on-line for the Men's Invitation Day on 25th May. 25th to 28th April - The Secretary's Putter - Who is the best putter in the Club?